AntiMatter Games gives us a small update about their pledge drive going on and shows off another green, the Clal-Chk Scientist. 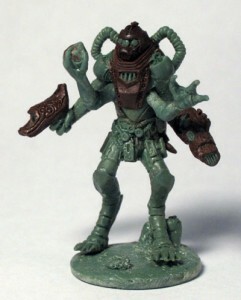 We are making good progress so far on the pledge drive and have now unlocked the first mini, the Conjuror of the Ethers for the Ancients of Atalán. The drive is lasting until September 15, so there is still time to get the special launch deals and get this mini added to any pre-order package for $6. The next one in line is the Big Game Hunter for the Fortune Hunters, carrying a harpoon cannon, so we need to reach $3000 to get there.